Made in Romania by Scholl, these woman's size EU 38. 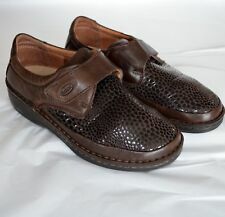 US 7 - 7.5, brown leather with a stretchy brown croc like embossed fabric vamp, loafers have a wedged heel (1 5/8") and a removable insole. They show light overall wear, leather scuffs, sole and heel edge wear. lots of pictures so be sure to use the zoom and enlarge features so that you can truly see what they look like before purchasing. This back-to-basics round toe flat is timeless and practical. A variety of colors and materials make the friendly from Dr. Scholl’s the ultimate go-anywhere flat. Lightweight and flexible footbed memory foam cool fit cushioning provide all day comfort for long days. 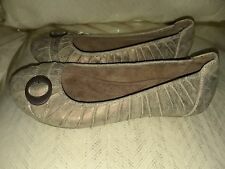 Dr Scholls Fateful Go Play Womens Size 6 M Tan Slip On Ballet Flats Slide Shoe. Great Condition. Please look at the pictures for more detail description. This item will fit in a padded envelope. I scout small towns forlong lost treasures from the past and present. Andrew (B6). I will try my best to be polite, respectful, and reasonable. Model: Katie. Size: US 7M. Material: Leather.